An interesting green alga, about 100 mm tall, growing on the bottom of the Botanic Garden’s ponds has appeared — it is Chara globularis. 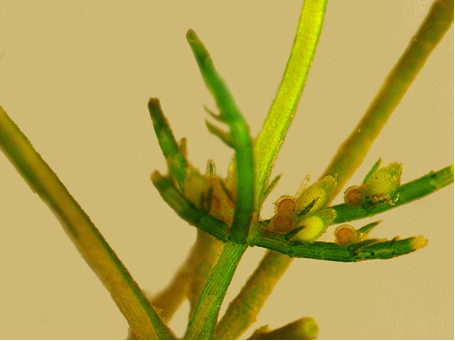 Carolyn Ricci and Bob Baldock from the State Herbarium’s Phycology Unit report that the alga is often found in calcium-rich waters. 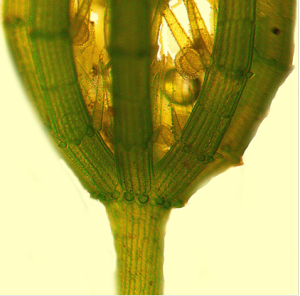 Its central stalks are ribbed with cells that accumulate lime crystals, and there are rings of stiff side branches ending in points. The female organs are bottle-shaped, wrapped in five twisted cells and stoppered with a cellular plug. Male organs in this species are spherical, lurk just beneath the females and are orange. Who said that algae are simple life forms? This entry was posted in The Plant Press on 6 March, 2014 by Jürgen.